In 1974, famed daredevil, Evel Knievel was at the height of his fame, and it was decided that this folk hero stuntman should have his own television show. Of course, Knievel himself was too busy and too disinterested in acting to star in such a show. 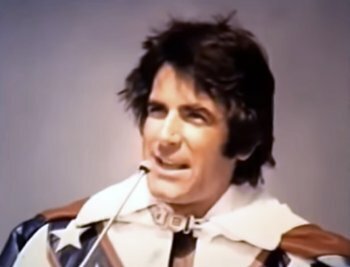 In a movie on his life a few years earlier, George Hamilton, he of the famed suntan, starred as the motorcycle legend, with Knievel himself performing the motocycle stunts. When it was decided to try to bring Evel Knievel to the small screen, the task fell to a then-unknown, Sam Elliott (seen right), many years before he reached the full heights of his own stardom in Tombstone, Gettysburg and The Big Lebowski. Commissioned by Viacom for CBS, the pilot was not picked up, and instead flamed out and missed the landing-ramp. This pilot was directed by Michael O’Herlihy, a veteran of Star Trek, Gunsmoke and MASH, and it was written by Richard Admas, who’d scripted shows like Combat and Kojak. In this pilot, Evel has to face off against a female daredevil in a “Battle of the Sexes.” The cast is rounded up by recognizable TV veterans Gary Barton and Nobile Willingham, and the female daredevil is played by Karen Philipp, a former singer for Brasil 66. It’s not hard to see why the show wasn’t picked up. It’s goofy as hell, especially in that it shows Knievel as a law-abiding citizen. Three years after the production of this pilot, he was convicted of assaulting Shelly Saltman, one of the producers of the failed Snake River Canyon jump, with a baseball bat for writing an unflattering book about the daredevil. That stunt cost Knievel all his endorsements and toy deals, and eventually lead him into bankruptcy. Despite that dark period, the man rebounded and recovered, and by the time he passed away in 2007, was a celebrated pop culture icon. Evel Knievel remains a beloved folk hero and this unsold TV pilot is a wild reminder of just how big a star he was in the 1970s.